there are mini versions, the double biscuit (cookie) version, cheap ones and expensive ones. If you are really lucky though, you might be on the street and find a vendor making and selling fresh Stroopwafels, these are in an entirely different league, soft, chewy, warm sticky caramel dripping delicacies of deliciousness. My personal favourite is the double biscuit version because I find the other types overly sweet, my children, given half the chance (increased if visitors have come to stay) inhale as many of any sort as they could get their hands on and Himself likes all varieties but does moderation far better than the children do. A few years ago I was musing about other ways to enjoy these biscuit treats, and wanting a really different dessert, decided to try a sort of ice-cream cake using these as the main ingredient. Not having a recipe I just eyeballed the ingredients and made it up as I went along. This is a recipe where no stove-top or oven cooking is necessary but it would be handy to have a really large bowl or even a large saucepan to mix things with. You will also need some thick rubber gloves because you need to use your hands and things get very cold and messy. I have a Tupperware container in my cupboard that contains rubber gloves of the washing-up variety which I only ever use for food. They come out if I am cooking and prepping beetroot (beets) for bottling (canning), and whenever I have to mix a lot of ingredients by hand. Before I start with the ingredients, I first need to line a low sided pie dish with cling film, so that I can get the taart back out of it later. 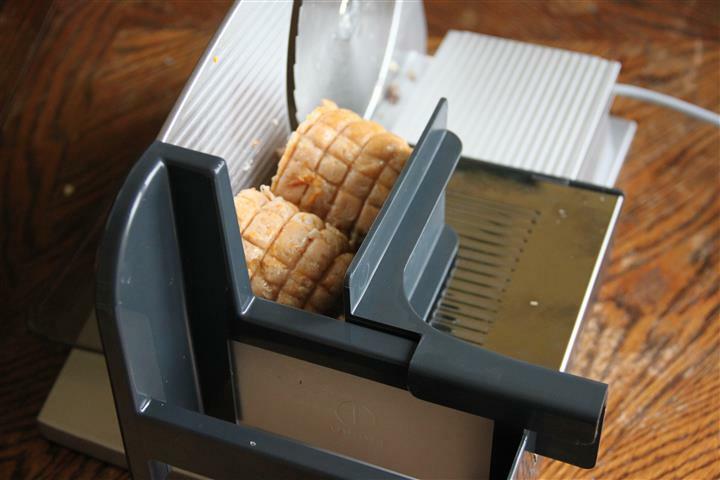 Open several packets of Stroopwafels, using the thicker double-sided biscuit ones as well as the normal ones, added to a food processor and reduce to crumbs. Split this crumb mixture into two parts, reserving one half for use later in the recipe. Put half of the crumbs into a large mixing bowl, add half a cup of white caster sugar, a teaspoon of ground nutmeg, and enough margarine, approx 2 heaped Tablespoons to form the mix into a dough that holds together. (I took these photographs on an occasion when I made two of these at once and didn’t have quite enough stroopwafels, so added come plain biscuit (cookie) crumbs… Maria’s, Graham crackers, Vanilla or Round Wine biscuits would all do). Next, press your cookie dough mixture into your low sided pie dish, covering the base and curving the mix up the sides to reach to top of the dish. 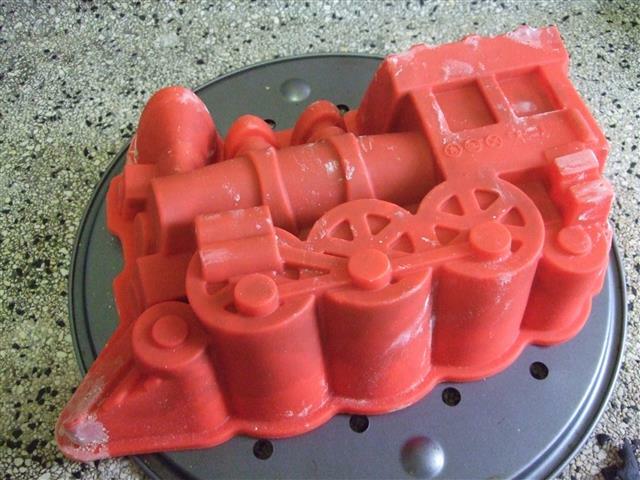 If the weather is warm, refriderate to firm up the mix until the next step is completed. This is where the largest bowl you pocess and an extra pair of hands will come in handy. Either way you will have to work very fast and have everything you need to hand. I usually rope in Himself or Kiwi Daughter to help with this stage. Take two 1 liter containers of icecream, (in our case we also have Stroopwafel Icecream in the Netherlands, but vanilla would be just as good) (Ideally the first person gets the ice-cream out of the tubs whilst the second person mixes like crazy) get all of the ice-cream out and into your large bowl. Add ¾ of the remaining Stroopwafel crumbs and (the person wearing the rubber gloves) mix into the ice-cream as quickly as you can. Then quickly add the remaining crumbs over the top of the taart and cover with plastic cling film (your helper is useful here too) and get it all into the freezer as quickly as possible. The entire time for mixing and getting everything back into the freezer should be only a few minutes. Cover with foil as well if you would like to freeze this for a month or more… and freeze for at least 24 hours before cutting. To cut, you will find that cutting the entire taart in half will release the rest from the sides more easily, in fact this is usually so successful that I can lift half of it our in one piece, which when transferred to a cutting board, can be then easier cut into small pieces with a large knife. Do work fast when cutting the pieces, and keep them small, a piece of this is very filling. 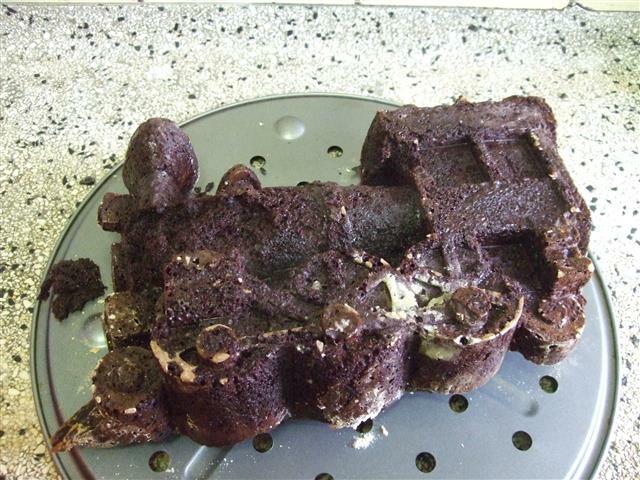 Be warned the pieces will be really solid and you will have to work hard to cut it, for this reason I now cut it into pieces in the kitchen well before needed, then return it to the freezer so that it’s already in pieces when you bring it out to serve. I’ve managed to get as many as 18-20 slices out of each taart, especially when serving in partnership with other desserts or after a large buffet meal. There are lots of advantages of having family who have become very familiar with a particular place over a long period of time. 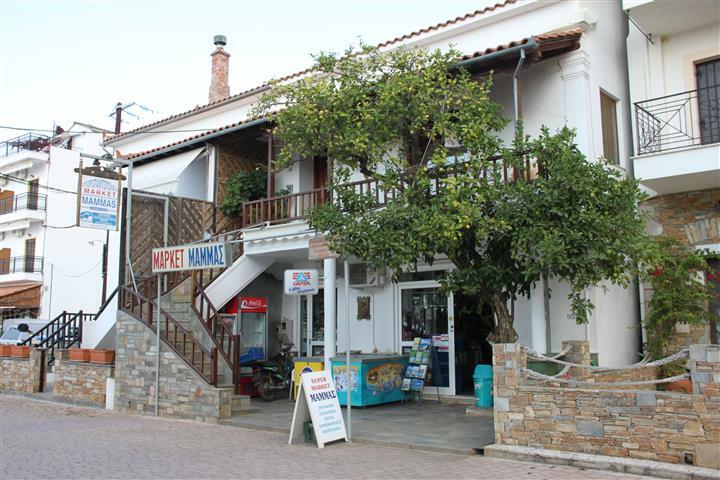 Our in-laws have holidayed in Platania for several decades and now own a small holiday home there. 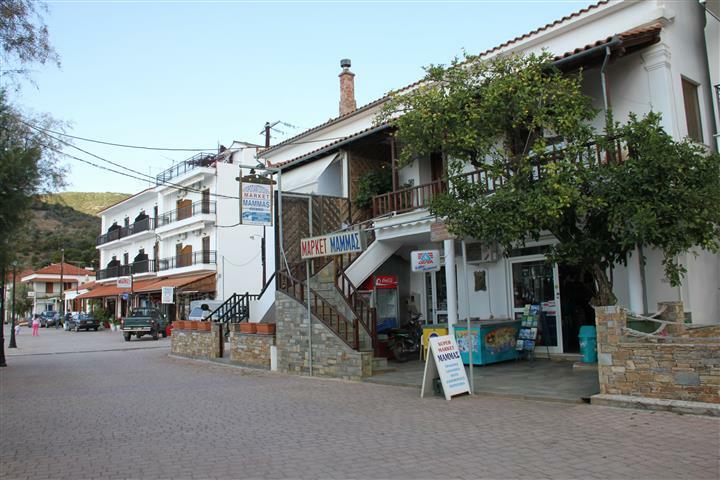 Not only are they excellent friends with many of their neighbours, they have learned Greek and the whole village knows who they are, and many locals are also good friends. One of their Greek friends is Thomas, the owner of the small local grocery shop, and I had instructions from my sister in law when I went there to let Thomas know that I was “family”. The smile and friendly greeting that I was received with quickly got broader and I soon had recommendations of places to go, the best products to buy, and by the end of our stay, his family recipe for curing olives. We visited Platania in the last week of October 2012. 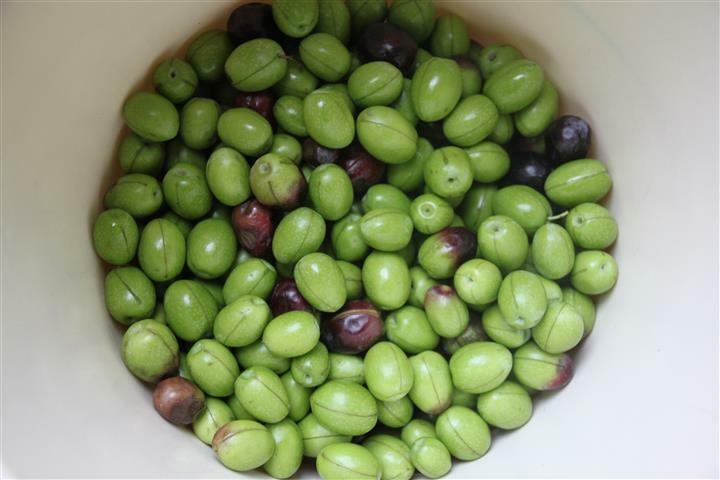 It was our children’s half-term school holiday but luckily for us, it was also the beginning of the olive harvest in Greece. Himself and I are olive lovers, Kiwi Daughter is slowly acquiring the taste and mega fussy Little Mr, who knows, might discover the taste of many a gastronomic delight one day in the future. 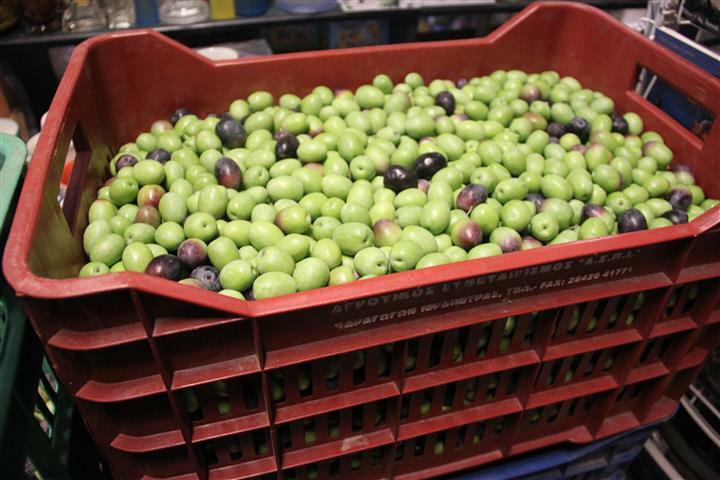 Two days before we left Greece the olives started to arrive in the shop… there are trees everywhere and naturally many local cure olives from their own gardens but there are also freshly picked olives for sale in the shops. I tentatively asked the price thinking they would be expensive but got a very pleasant surprise when I found out that 1 kilogram of olives costs only one Euro. This was the moment I started ruing the fact that we had packed light for our budget airline flight and had squeezed everything into a small bag for the convenience of having only one bag and not two. Fortunately my brother in law had bought some tools for their renovation project from home and was planning to use them when he came back in the new year for a “work week”, so there was space in their luggage I could use. I stocked up on five kilograms (approx 10 lb) of fresh olives for the princely sum of five Euros and with Thomas’s recipe ended up with the best souvenir I’ve ever bought in my life. Kiwidutch Tip: Our In-laws cured the olives off their trees at the same time as I did mine. 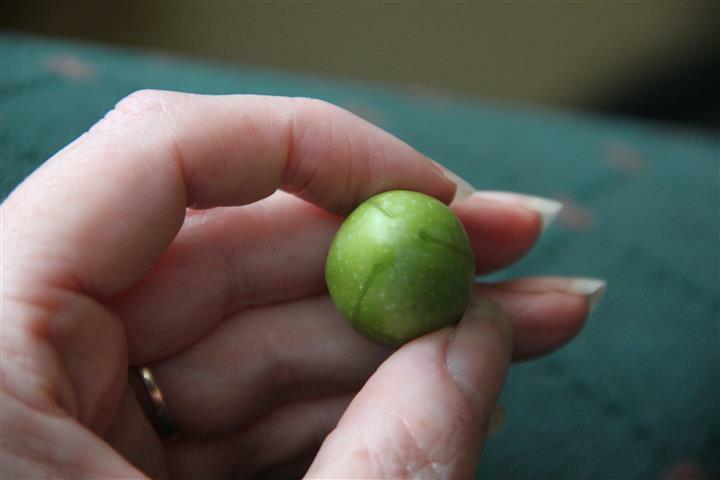 Both lots were edible around Christmas time and they couldn’t resist trying theirs: once they did, their entire stash of olives was gone by the time they rang in the New Year. Family Kiwidutch put our olives into jars and stashed them out of sight so we wouldn’t be tempted. 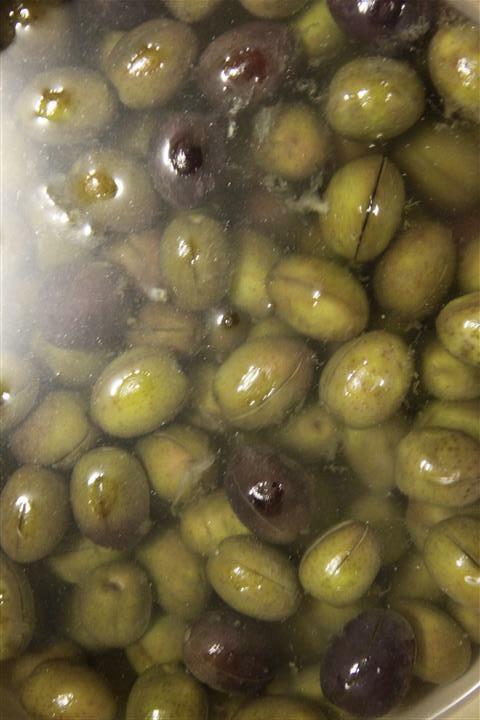 We opened the first jars in April 2013 with extended family members present and the in-laws who had finished their olives, immediately conceded that we had hit the jackpot by leaving ours a few months more…the olives were soft and beyond delicious. 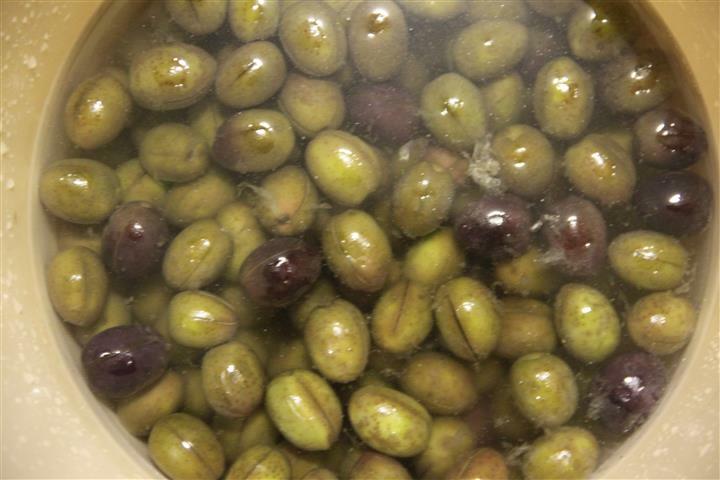 Commercially bought olives taste nothing like these… so if you think commercial ones are good then you would find this recipe simply divine. 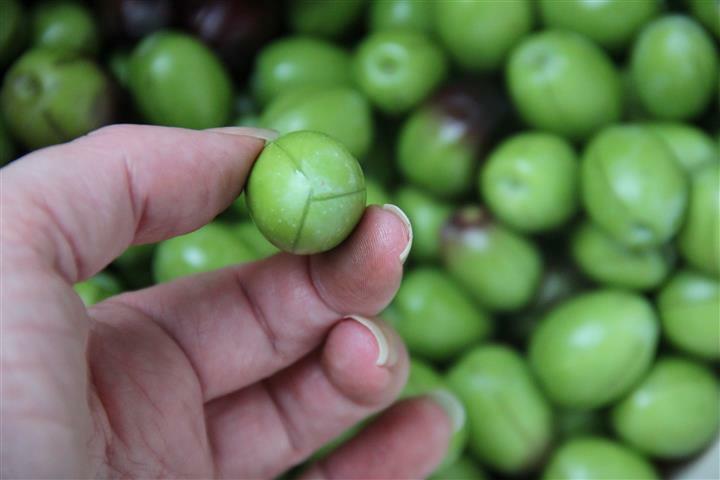 – Take each olive and slice lengthwise three times. 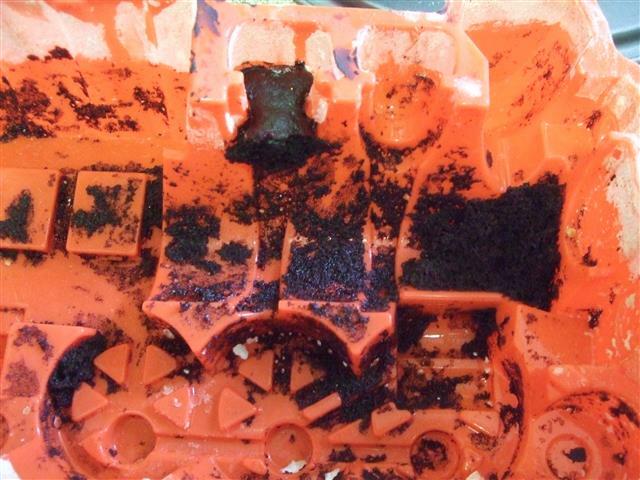 – cover with water at least 1 week and change water every two days. – after 1-2 weeks tip the most recent water out and for every litre of water you put in new, add 80g salt. 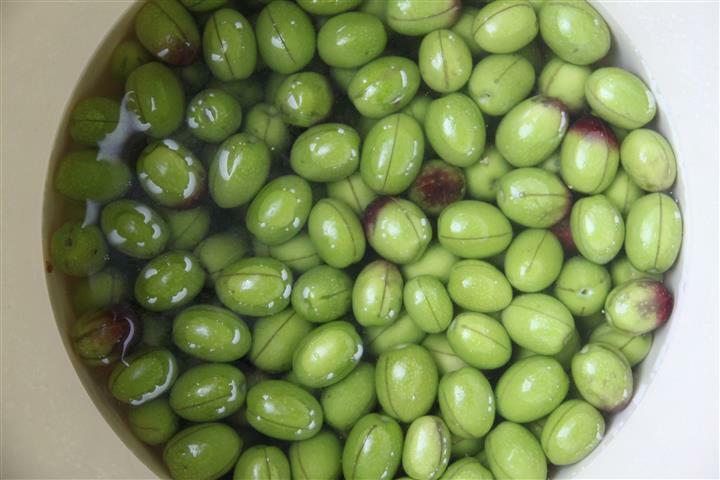 Soak olives in this mixture 1 week. 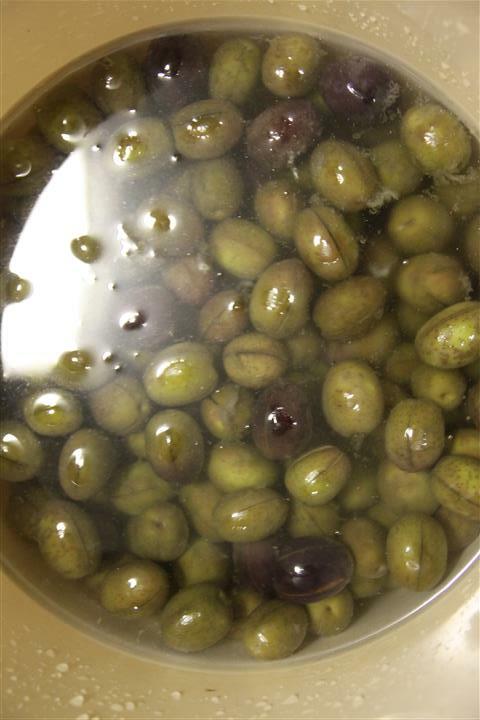 – after 1 week rinse off the salt water, and make the following mixture: 50-70 ml olive oil + 150g vinegar + 80 grams salt for very litre of water used(the water should cover the olives). Keep the olives in this new mixture for two weeks. In “theory” the olives are ready to eat at this point BUT if you keep the olives in a cool dark place the flavour will improve with age. If you want to flavour your olives with garlic etc then add the garlic into this mix. You can also put the mix into glass jars after the two weeks so that you can age them, and the olive oil in the mix should float to the top and seal the jar. 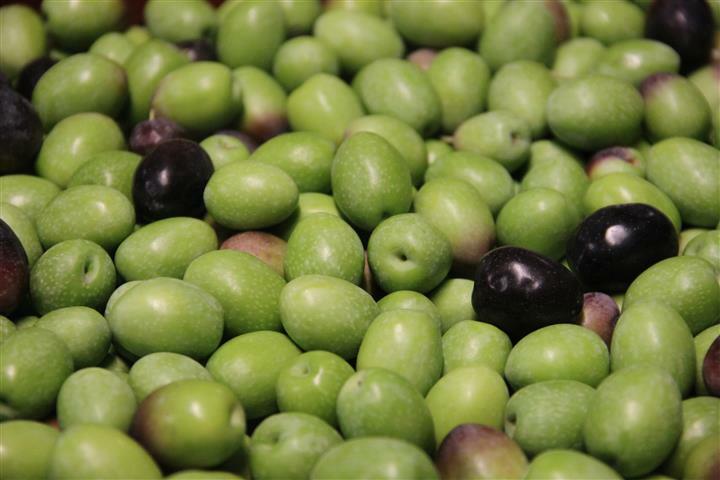 Thank you to Kathy who’s question reminded me of this: ONE note That I forgot to add: After opening a jar when your olives are ready you then keep these in the fridge: the cold will make the oil go almost solid in the jar. that’s perfectly ok.
Mama’s Kitchen (Hope) posted this recipe on what was the then “Recipezaar” (now Food.com) website. I am currently going back though my recipe book and looking for ones that are easy to make, especially when we have a few people around. 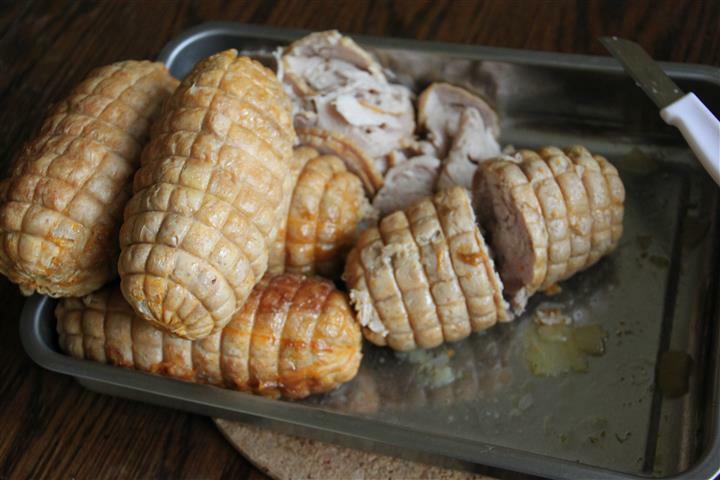 Not being able to stand very long in the kitchen really produces problems when I want to make something for visitors, so sorting out recipes like this one where parts (like the meat filling) can be made in advance and where the oven does most of the work last minute. I tend to use whatever Dutch cheese we have to hand, I triple the coriander (cilantro), I’m too lazy to de-seed tomatoes and I tend to throw in some additional piri piri if I serve people who like their food with a kick. 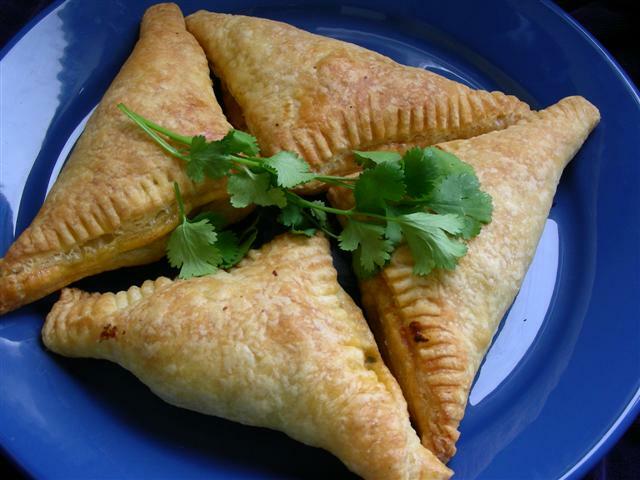 These were deceptive, at first I thought they were rather a dry-ish meat mixture enclosed in pastry and *then* the little kick of the cilantro/coriander and chili powder wound this up a notch with a slap in the taste buds that was quite refreshing. They certainly make nice appetisers or pot luck dish (all pre assembled and with an oven available to cook them in), or cocktail party where you’d like guests to be eating more substantially than just cheese on sticks with their drinks. I could also see this as an entrée/ appetiser to a long sit down dinner with time and conversation in between courses. Don’t be put off by the long list of ingredients, basically you throw in all the filling ingredients, add the cheese last and then fill the pastry squares. Easy! 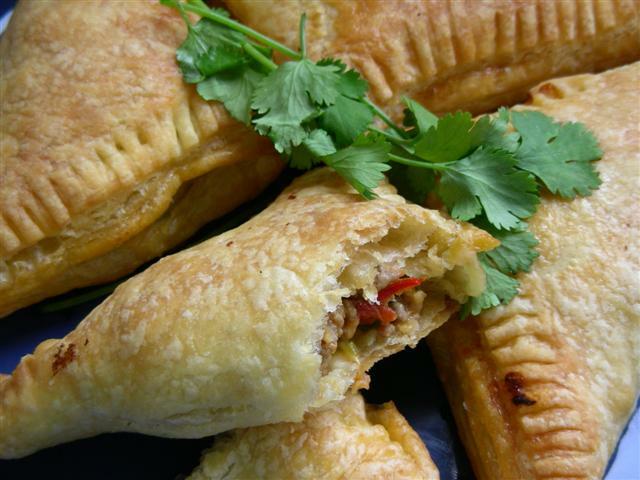 Remove pastry from freezer and allow to thaw at room temperature for about 30- 40 minutes or until they are easy to handle. Meanwhile, add the beef, onion and green pepper to a large skillet and cook until beef is browned and vegetables begin to soften. Stir occasionally to break meat up and prevent scorching. Add garlic and cook for one more minute, stirring constantly. Drain all the grease from the pan and return to the heat. Add tomato, catsup, cilantro or parsley, cumin, chili powder, oregano and cinnamon. 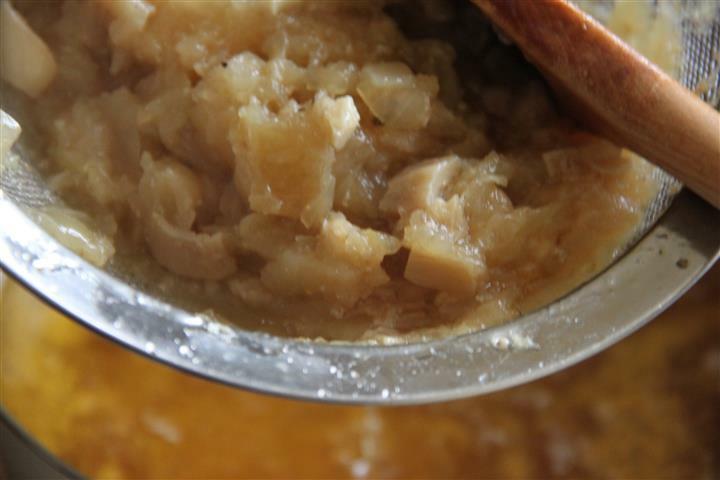 Reduce heat to low and allow to simmer for about 10 minutes. You want a pretty dry mixture so your filling stays put in the pastry. Remove from the heat. Stir in the cheese and set aside until cool enough to handle. 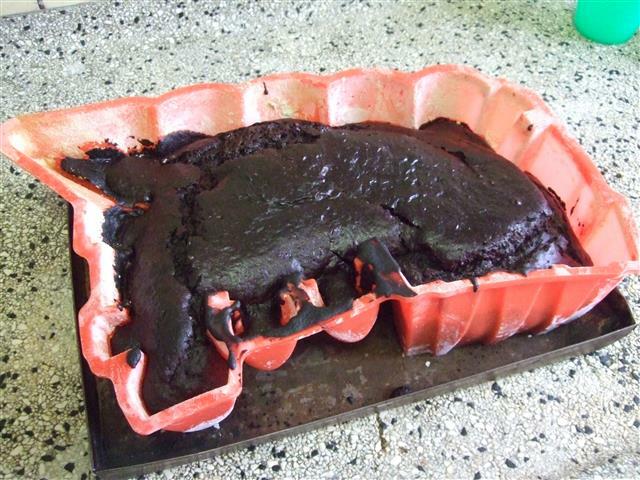 Work with one pastry sheet at a time, keeping the others covered so they do not dry out. On a lightly floured surface roll out a pastry sheet to a rectangle about 16 x 12 inches and then cut into 8 even pieces. Put a heaping teaspoonful of meat mixture in the center of the pastry. (I always seem to over fill them no matter how carefully I measure so you may want to start with less than you think you should use and add a little more if needed. Voice of experience! ). Mix the egg and water together and brush pastry edges with it. Grab one corner of a pastry and fold over to form a triangle. Press edges with a fork to seal and brush the tops with more egg mixture. Place the pastries on a sprayed or greased baking sheet. You could also use parchment paper or a silicone liner. Bake at 375 degrees for about 15-17 minutes or until golden brown. To Freeze and Bake Later: Place pockets on parchment paper or wax paper and freeze until firm. 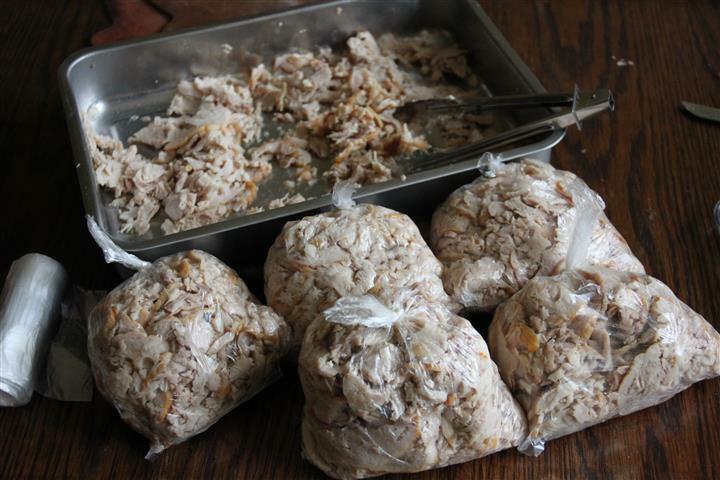 They can then be transferred to a zip top bag and stored in the freezer. Remove desired amount from freezer when ready to use and bake as directed, increasing time to 17-20 minutes or until golden brown. Great served with sour cream, catsup or your favorite dip. Summer days call for simple meals, whilst I am home on sick leave, on good days I try and help out in the kitchen. Anyone who’s ever had a complex injury will know, it’s not just the damaged limb that gives you grief, it’s also the side effects of the medications and the chain reactions that effect other parts of the body. Unable to stand on the front part of my left foot, I opt for putting weight on my heel, and then as the pain increases, simply standing on my right leg instead. Using crutches for three and a half years has resulted in weak muscles in my lower back, to the extent that I now have a back problem that is expected to continue as long as I do not have a normal walking gait. Standing is painful for my foot, sitting is painful for my back so I spend the day sitting, laying or standing, up and down like a yo-yo. If I manage to get comfortable I often try and stay like that for as long as possible: not necessarily a wise decision because after say an hour of sitting I’m so stiff I look like an old lady of hundred and three trying to get up again. I feel like I’m a hundred and three too several times a day so on good days when I want to help out with cooking the biggest requirement of the recipe is that it’s quick and easy to make. Himself and Little Mr are “pasta monsters” and could almost eat the stuff for breakfast as well as lunch and dinner, and since my accident Himself has taken over most of the cooking which predictably features pasta every day. I like pasta, but in my humble opinion not all pastas were created equal, personally I personally prefer the thinner ribbon sorts of pasta like Fettuccine, Linguine or Tagliatelle” to the thicker tubular varieties. Usually if I’m cooking I usually lean towards potato or rice dishes for the sake of variety but there are a few pasta recipe that I really fancy sometimes and this recipe is one of them. Naturally it features one of my very favourite pastas: Linguine, but sometimes our shops only have Fettuccine in stock (a similar slightly wider ribbon pasta) so I often use that too. 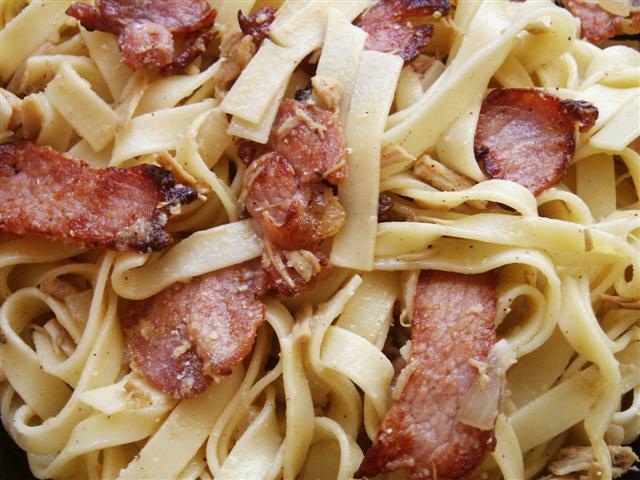 Over the years since I reviewed Ingy’s recipe (link to original recipe below) I’ve made various tweaks to suit our family: Our littlest pasta monster hates onions so I distract him by throwing in more bacon. I’m trying to cut out unnecessary fat so I gently fry off the bacon and get rid of as much excess grease as I can, (that can be a little or a lot, sometimes I’m shocked at how much grease is in the pan), then I add the stock and simmer the finely diced onions (fine dice makes them less noticeable by the picky ones) until they are clear and no longer crunchy (if I’m making this to go on a buffet table I keep it crunchy). I make home-made vegetable stock in my crock pot overnight regularly and usually have some in my freezer so if I don’t have chicken stock to hand I use the veggie stock instead, and once or twice I’ve given this some adult zip by adding diced hot red chili peppers to the mix. However you choose to tweak this, it’s sure to become one of your favourites too. Boil linguine for about 8 minutes, or until al dente. Strain when done leaving about a cup of pasta-cooking water aside. Heat olive oil in large, heavy skillet over medium heat. Add bacon and cook, stirring until bacon is browned and still soft in the center, about 6 minutes. Remove bacon from skillet, leaving 3-4 T. of fat in the pan. Add onions and cook until wilted but still crunchy, about 4-5 minutes. Add broth, bring to a boil, then adjust heat to a simmer. Cook until liquid is reduced about half. 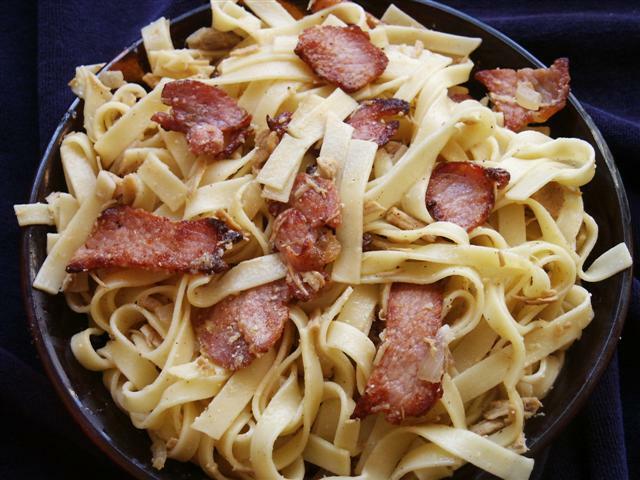 Combine pasta with the onions and “sauce”. Stir to coat the pasta. Add pasta water if necessary, to coat pasta. Remove from heat and add egg yolks one at a time, tossing well after each. Add grated cheese, then black pepper, tossing well, and serve immediately. Meanwhile, warm oil and garlic in a skillet over medium heat. 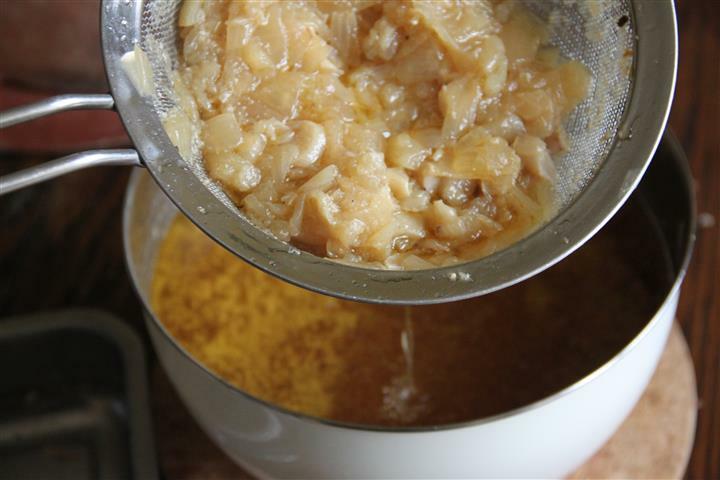 Cook until the garlic is fragrant, being careful not to brown or burn. Remove the skillet from the heat and stir in the lemon zest and salt to taste. The water should be close to boiling. At this point, add salt and the linguine. Cook until pasta is al dente (follow the directions on the package since cooking times vary product to product). Reserve 1/2 cup of the pasta water in a small bowl. 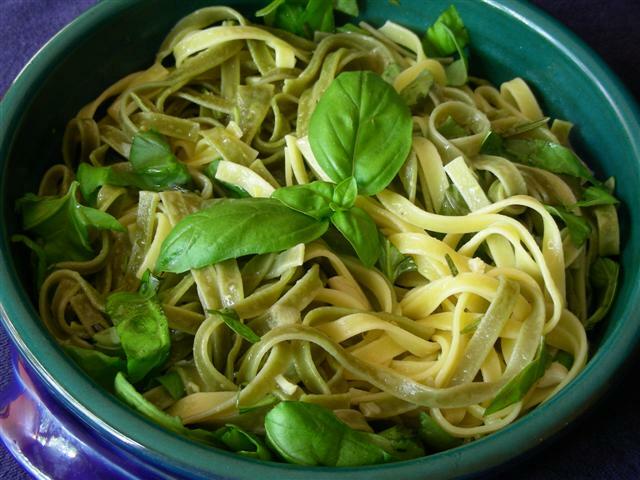 When pasta is cooked, drain and toss with garlic mixture, herbs and lemon juice. Add the reserved pasta water as needed to keep the pasta moist and a little saucy. This recipe from “rsarahl” from the former Recipezaar (now “Food.com”) website has become one of our family favourite when having guests to dinner. 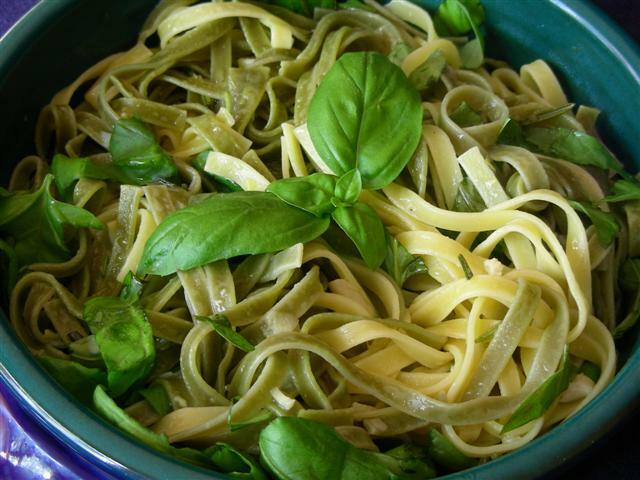 Although according to the recipe any of your favourite herbs can be used, we always go for basil, and lots of it. 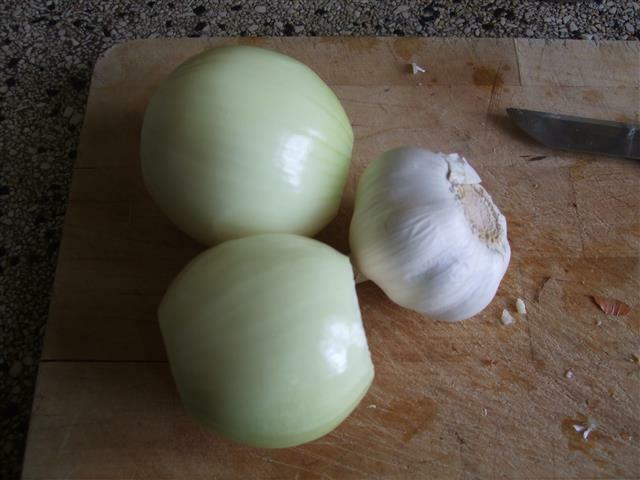 We also use around six cloves of garlic, and more or less oil depending on how many servings I’m making. (I try and use the least amount of oil as possible). 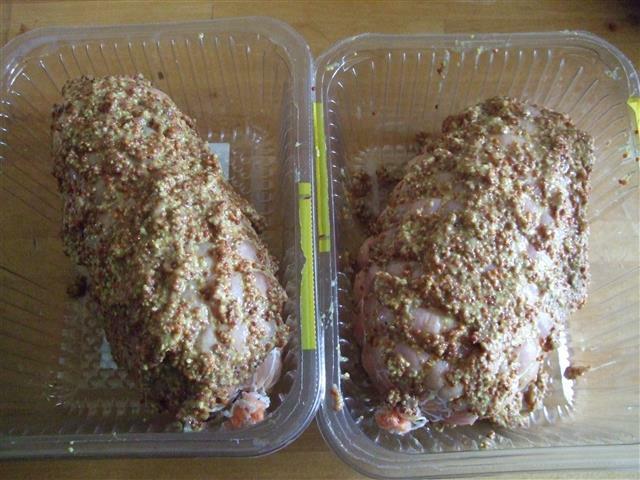 We also like that the recipe is quick to make and most of all, delicious!!! This a recipe that one of my Australian foodie friends (” Jewelies”) got from another Kiwi (New Zealander). I tried it out and thought that the curry, mustard and bacon bits lifted it out of the ordinary and bought some excellent taste together. The vegetables were an added bonus. In my original review of the recipe I also wrote: “It was good to pour off all the fat that always comes out of meatloaf at the halfway stage and to bring in the sauce to stop it drying out, but I was a little disappointed that the sauce stayed quite thin as I expected it to thicken a bit and make a nice saucy topping. I also had to point out to Himself that the red bits of meat inside was actually cooked bacon and not raw meatloaf . 4 lovely stars for a recipe that tastes excellent, the only thing that stopped me from going to 5 stars was that the meat was a little too soft for our preferences and that the sauce stayed very liquid indeed. Fry bacon in oil and crumble. 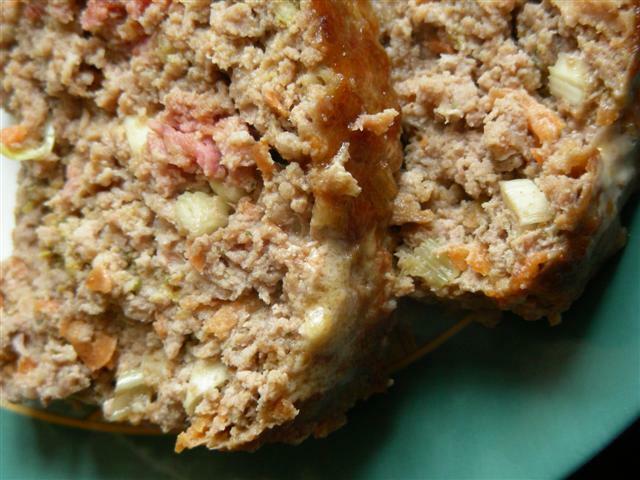 In a bowl mix all of the meatloaf ingredients thoroughly. (I mix with wet hands). While waiting to cook make the sauce. In a saucepan place all sauce ingredients and stir on low heat until blended. 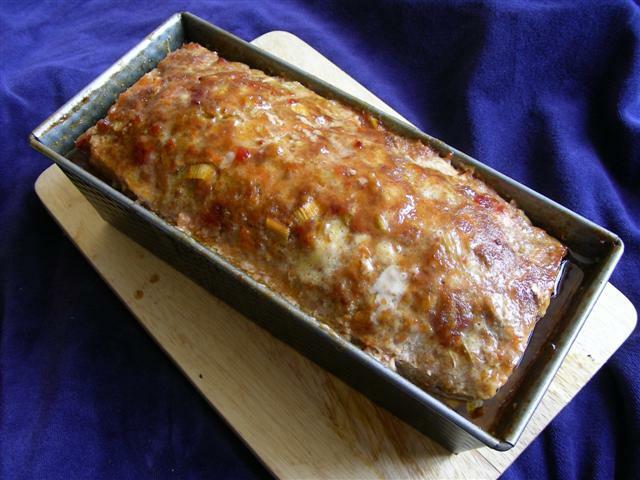 Remove meatloaf from oven and pour off excess fat. Pour sauce over and replace in oven at 180c for a further 30 minutes. I’m going back through some of my cookbook recipes and tweaking some that had promise but that I wanted to try and improve on. 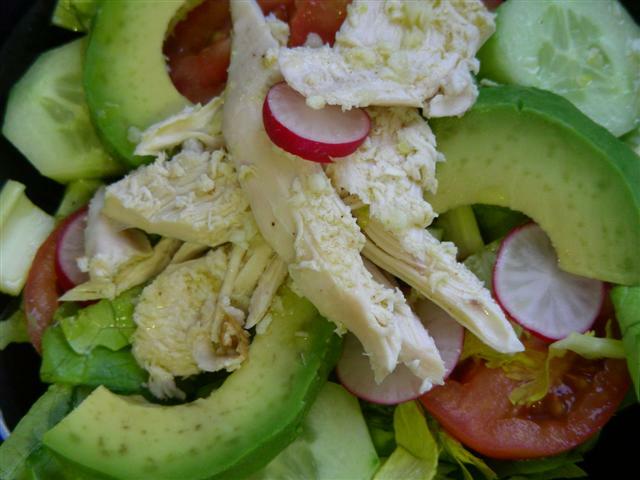 ” I was pleasantly surprised by this recipe.. the flavours are fresh and full of zing and the lime/garlic combination especially compliments the celery and radishes as well as the chicken. Raw celery here in NL isn’t really great tasting at all but I used the very centre pieces and leaves which had a sweeter flavour and it actually tasted ok.
At the end of the day the Poulier was out of cooked chicken and supermarkets here don’t sell them cooked so I roasted a bird myself and used that. 4 excellent stars for a different salad recipe, not one that tops our all time favourites but definitely one for when we fancy a change of pace and taste. I think we would also prefer this salad and its flavours on a hot balmy day in Summer.. Thanks!” Since that review this recipe comes out every year, usually when the days grow warmer, a greater variety of fresh ingredients hit the supermarket shelves and when I am looking afresh at salads as weekday menu options. Over the years I’ve made various changes: first of all, Dutch celery never got any better tasting so I’ve ditched it completely. Radishes, I use if I have them to hand, otherwise I skip them too. Second, I’ve increased the amount of garlic and lime in the vinaigrette (We adore garlic and Himself now likes limes more than he used to so I use the juice of an entire lime which I guesstimate to be a minimum of six tablespoons depending on the lime) And last but not least I make the chicken pieces smaller and let the vinaigrette soak into it a bit before serving. Himself was never a fan of citrus flavours, but for a while now has been forcing himself to drink fresh lime juice and hot water every evening in an attempt to get more vitamins and hopefully less colds. He started drinking this with sugar added at first but slowly reduced the sugar until he could drink it totally without and a side effect has been a new appreciation for recipes with limes in that he used to shun in the past. I’ve always adored both lemon and limes so his original aversion was hard to understand, and now that he’s had his “Damascus” moment with limes it’s prompted me to revisit many more recipes that were formerly in the “just for me” section of my recipe book. 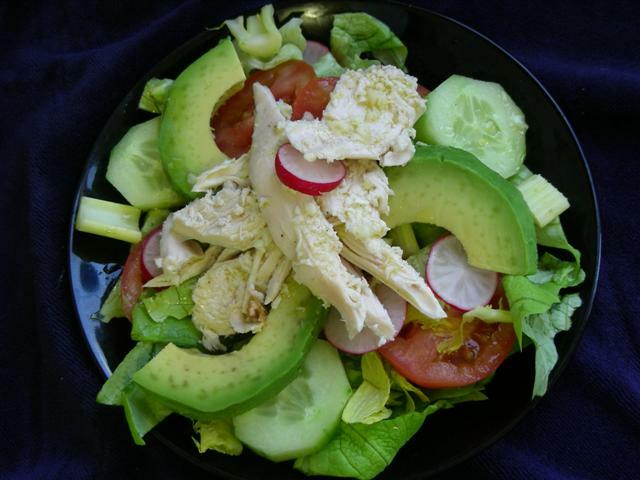 Combine lettuce, tomatoes, avocado, celery, radishes and cucumber in a salad bowl. 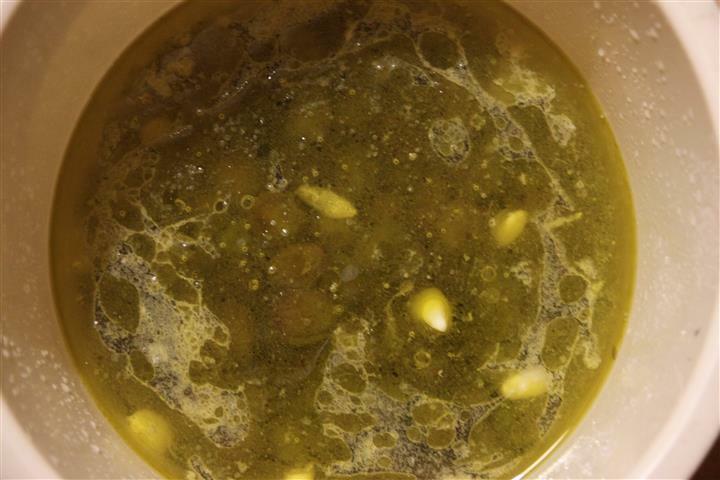 Blend Lime Vinaigrette ingredients together; lime juice, olive oil, garlic, salt and pepper. 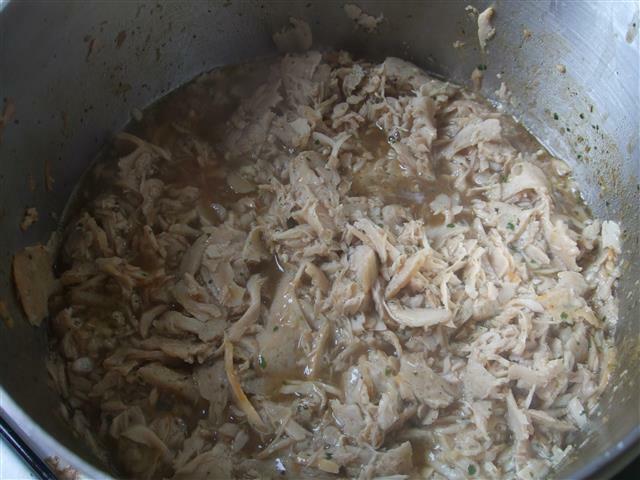 Mix chopped cooked chicken with lime vinaigrette. Toss chicken vinaigrette mixture with vegetables and serve. 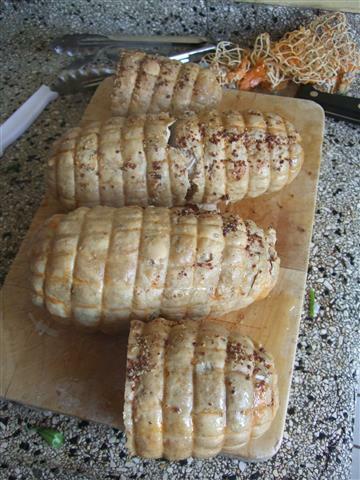 Chicken Roulade: Quick Prep, Slow Cook, Divine Result…. I scored this recipe from a fellow foodie friend after a dinner out at their place over a year ago. Since then I have made this recipe fairly regularly and have even tweaked the original recipe in a way that I think makes it even better. 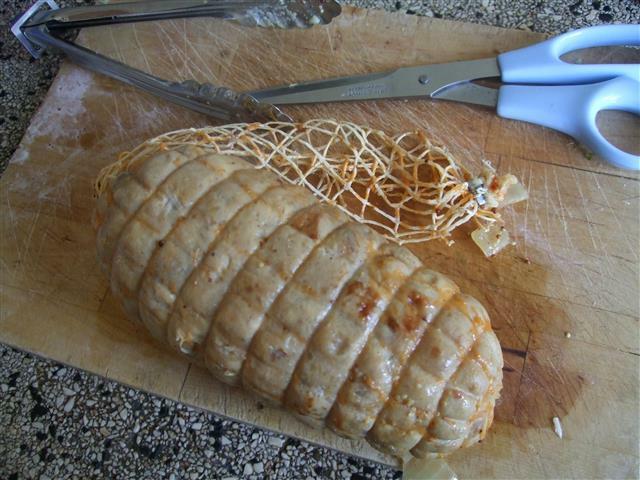 The recipe in question is a “roulade” and the name comes from “rouler” (French for “to roll”) and in the Netherlands at least, consists of raw meat tightly rolled up and encased in a net of butchers string. 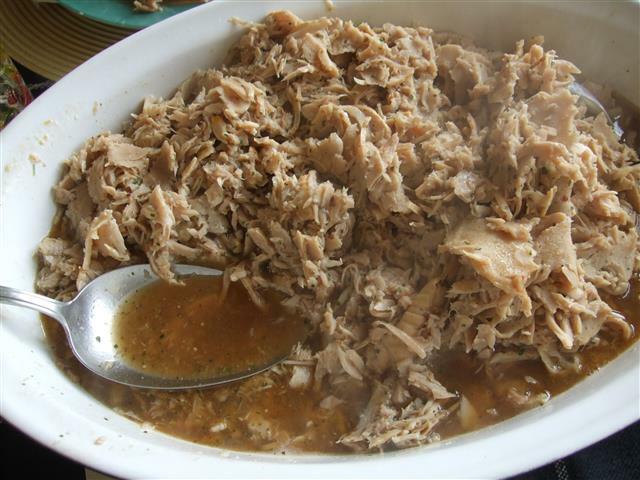 The meat is slow cooked, lifted out to cool, very finely sliced and a jus (gravy) made from the resulting stock. 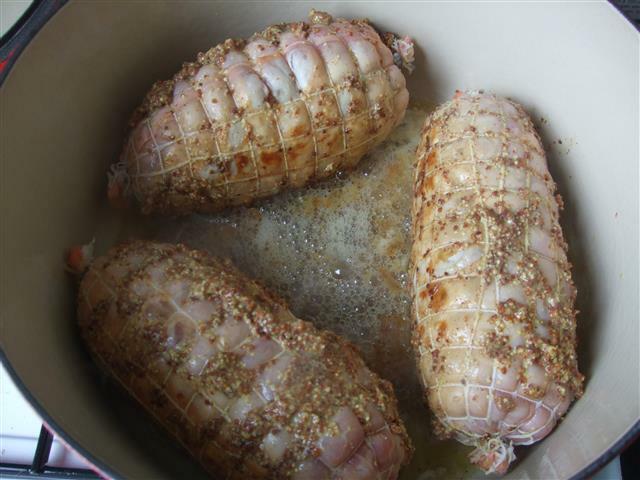 The cooked roulade meat is then served in the gravy. 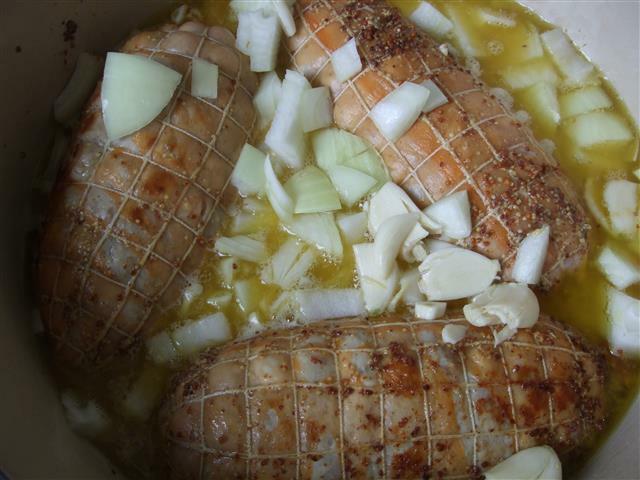 I know that roulardes come in pork meat and in chicken, this recipe is for the chicken version. What I like most is that there is minimal work needed for maximum flavour, the slow cooking is the secret and who doesn’t like an easy recipe? Don’t worry at all about this recipe being to “mustard-y”, even if you use a really strong mustard the resulting meat will have a lovely full flavour but rather surprisingly not at all be of overpowering mustard. 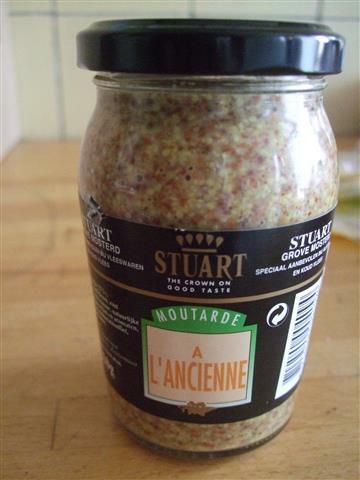 In fact, I never would have believed how much mustard this was made in had I not made it myself. The onion and chicken seem to balance things out perfectly. 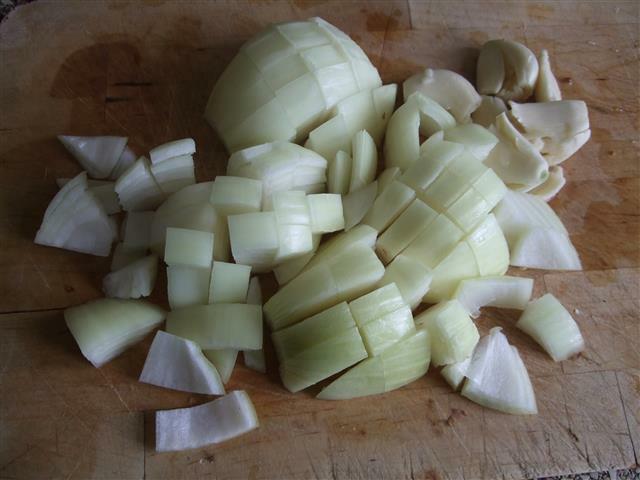 If cooking this recipe in bulk don’t be afraid to add as much garlic as you like and also some extra onion, as you will see later in the recipe, I use it all in the end anyway so nothing is wasted and the flavour just gets better and better. Since this meat is slow cooked, I usually cram my le crueset pan as full as I can manage and then later when the recipe is finished, freeze the rest of the meat for easy meals at a later date. I haven’t yet tried to make this in my crock-pot / slow cooker, simply because it’s so easy to make on the stove top: prepare and leave for hours to simmer. The only hassle is that sometimes the supermarket only has three roulades on their shelves, when I really would have liked there to have been five so that I could fill the pan up. I took the step-by-step photographs over various cooking sessions. With a spoon or a spatula, coat the roulade as evenly as you can with the mustard. Melt the butter on a low heat in a heavy based cooking pan, then place the roulade into the pan and gently brown it on all sides. 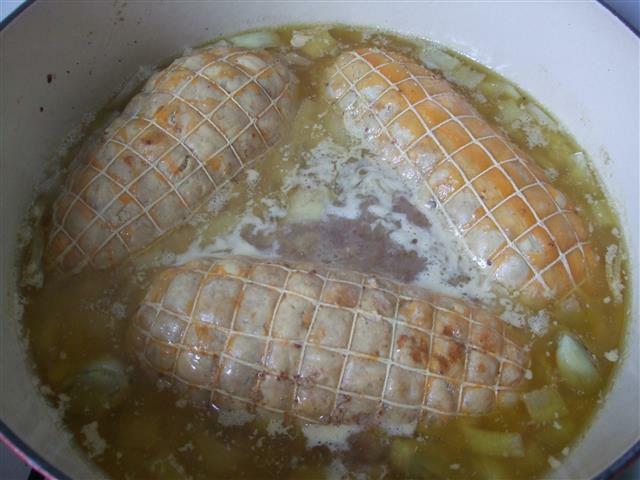 Cook on a very low heat (the water should be just moving) for 3 to 3 1/2 hours depending on the thickness of the roulade. 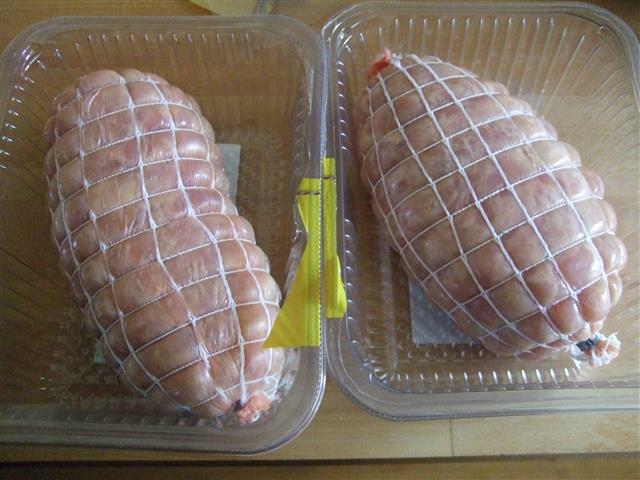 Remove the meat from the liquid, be careful because the meat is soft and the roulade can break apart at this point (even inside the string net). 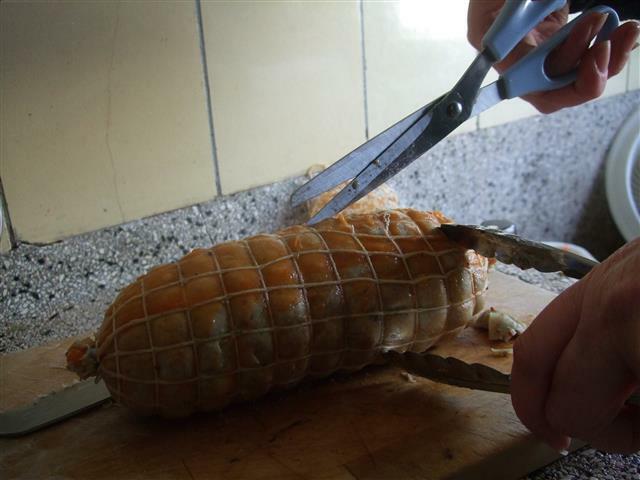 Whilst the meat is still hot, use tongs and scissors to gently cut the net away from the meat. (doing this whilst the meat is hot can be a little tricky but if you wait until the meat has cooled then the net will stick to the meat and tear chunks of it away when you try and remove it). Try not to break the roulade as you take the net off. 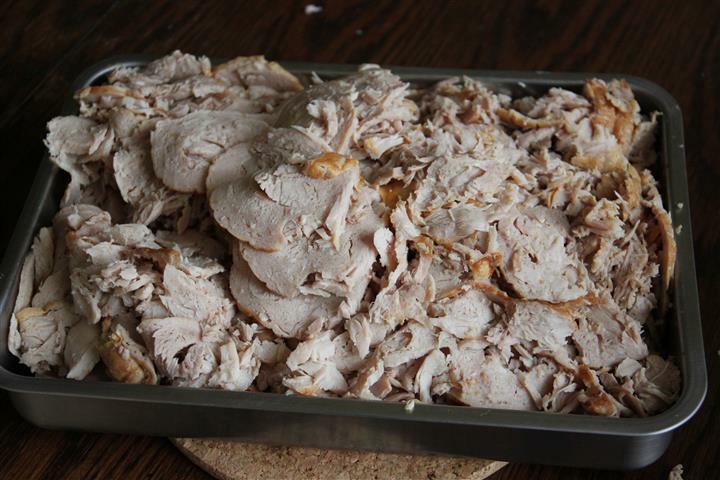 Leave the meat to cool completely before cutting it. 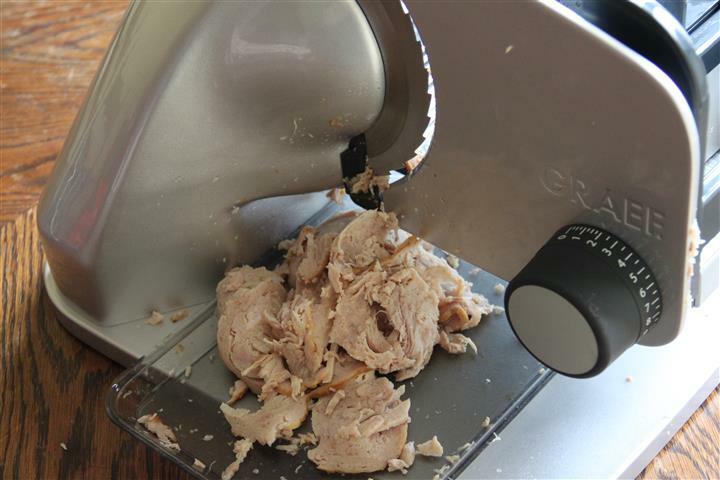 Take the cooled roulade and using either a very sharp knife or a cutting machine, cut as thin slices as you can manage. 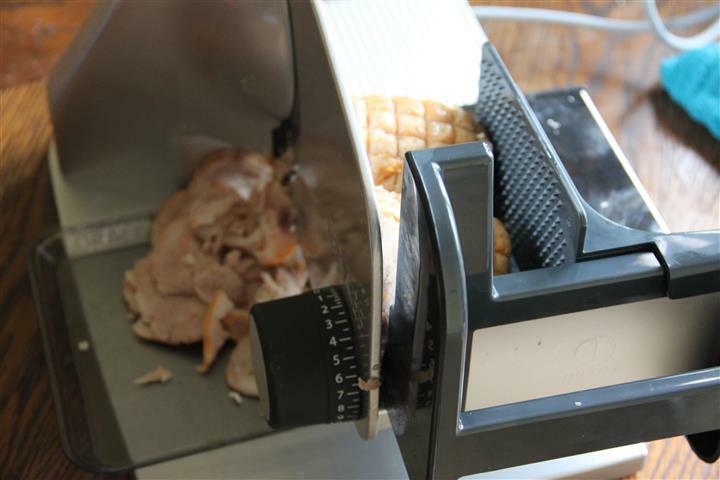 (my cutting machine setting made slices 1-2 mm thick). At this point in the original recipe my friend usually makes a packet mix of vegetable gravy and adds the meat to it to serve, my own addition to this recipe is as follows: Making sure to keep all of the liquid, Sieve the mustard/onion and bay leaf from the water, discard the bay leaf, and using a stick blender, blend the mustard and onion pulp so that it becomes a paste. Add some flour to this paste to thicken the gravy, cook it on a low heat and then add several cups of the liquid that the roulade cooked in for added flavour. 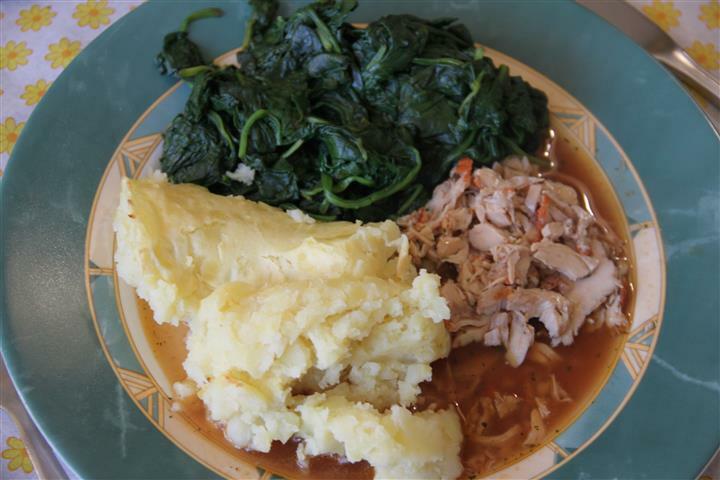 This recipe is divine with mashed potato, and I’ve mixed the chicken sans gravy into stir fry and pasta dishes. Yum!